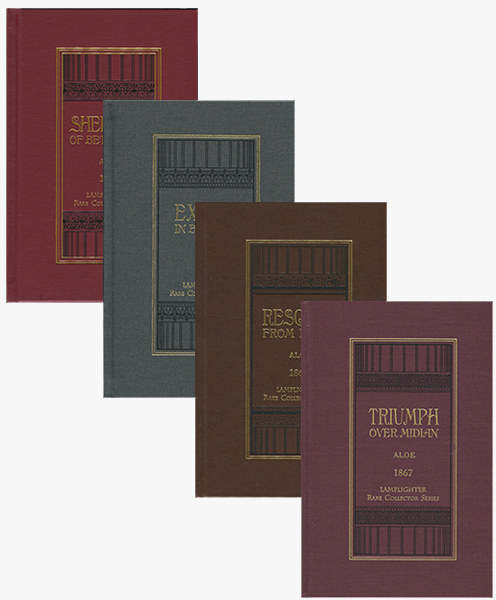 The Heroes of Faith Series - a spectacular four-volume set that brings the Scriptures to life! The pictures are so vivid, and the characters so real, it is as though you are walking right alongside the great men of faith - David, Moses, Daniel, and Gideon - and experiencing the momentous challenges they faced. While their courage and faith were extraordinary, you'll see that they were merely flesh and blood, and that our daily challenges can be met with the same fortitude and grit. In each story the characters of an English village set the stage, struggling through all-too-familiar trials and temptations. But just like their great heroes of faith, they are an inspiration because they are not stagnant - they change, they grow, they fall, and they stand again, with a greater sense of admiration for the One who is worthy of all praise! What do two spoiled brothers, an illiterate servant girl, a salty old sailor and the town mischief maker have in common? You'll find out in this exciting book by A.L.O.E., the first volume of the Heroes of Faith Series. There is no question that The Shepherd of Bethlehem will bring the Scriptures to life like no other book, as a fresh look at David's life reaches deep into your heart, cutting and pruning and drawing you ever closer to your very own Shepherd-your very own King! The second in this dramatic series by A.L.O.E. (A Lady of England), makes the Scriptures come alive! The pictures are so vivid, the characters so real, it is as though we are walking alongside Daniel and his faithful friends, experiencing the momentous challenges they are faced with. What courage! What great faith! Yet we are ever mindful that they were merely flesh and blood, no different than we are, and that our daily challenges can be met with the same fortitude and grit. The third volume in the Heroes of Faith Series, the life and deliverance of Moses as a type and shadow of the coming Redeemer is flawlessly incorporated into the story of Arthur, the main character. Arthur wrestles with the inner conflict of living for himself and the approval of others or living for Christ in spite of the rejection and ridicule he'll most likely endure, for he is related to his siblings by blood, but not by the blood of Christ. The characters are realistic and the story is captivating, but the best part is the dramatic, awesome ending!